Added on March 31, 2017 by ROSEGALLERY. Elger Esser will lead a walking tour through his exhibition Morgenland on 17 May, 2017 at Parasol Unit gallery in London. Elger Esser, Shivta, Israel, 2015. C-print, Alu-Dibond. This exhibition, his first solo show in a public institution in the United Kingdom, focuses on a new series of works, entitled Morgenland (meaning 'Morning Land'), created during his travels in the Eastern countries of Lebanon, Egypt and Israel from 2004 to 2015. The exhibition Morgenland will be from 29 March – 21 May 2017 at Parasol Unit. Added on February 18, 2017 by ROSEGALLERY. On view at the Landesgalerie Linz in Austria is Elger Esser's Landscape work. The exhibition will be on display until 23 April, 2017. 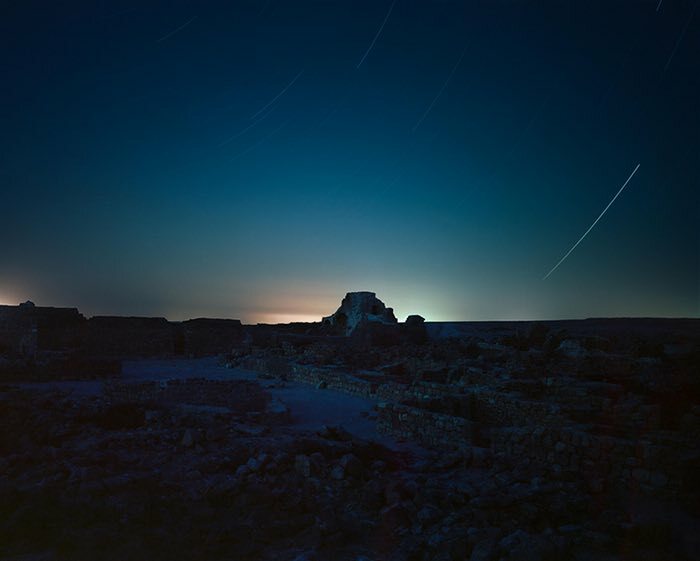 The Landesgalerie Linz will present the first single museum exhibition of the photographic work of Elger Esser in Austria in 2017. The central theme of his extensive work - the landscape - is the focus of the show. Through his classical compositions and the use of historical phototechnics, the graduate of the Fotoklasse by Bernd and Hilla Becher at the Düsseldorf Academy of Fine Arts is included in the tradition of baroque landscape painting and historical photography of the late 19th century. Added on March 17, 2016 by ROSEGALLERY. "In the era of romanticism, the artists would go on journeys and then in modern times it was the camera which travelled -- in order to prove that 'I have been there'. This is still important to many photographer colleagues. They would travel to Cape Horn in order to make a photo and to say 'I was there'. I would make a photo that looks just like Cape Horn but in fact is taken in Brittany, looking exactly like Cape Horn including storms etc. I care about the picture and not about where it was produced: I locate my pictures but I also displace them from their locations." Visit kunsthalle-karlsruhe.de for exhibition details. From 27 August to 31 October, Galerie Thaddaeus Ropac is showing a solo exhibition with new works by photographer Elger Esser. further landscape with a Weltbild projected on to it. 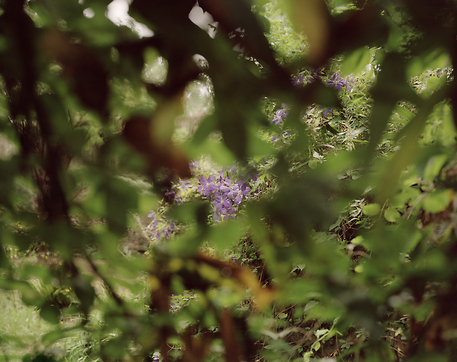 The leitmotiv of the exhibition is the iris: the iris as a flower, the iris of the sun, the iris of the photography. Sérignan-du-Comtat in the county of Vaucluse. 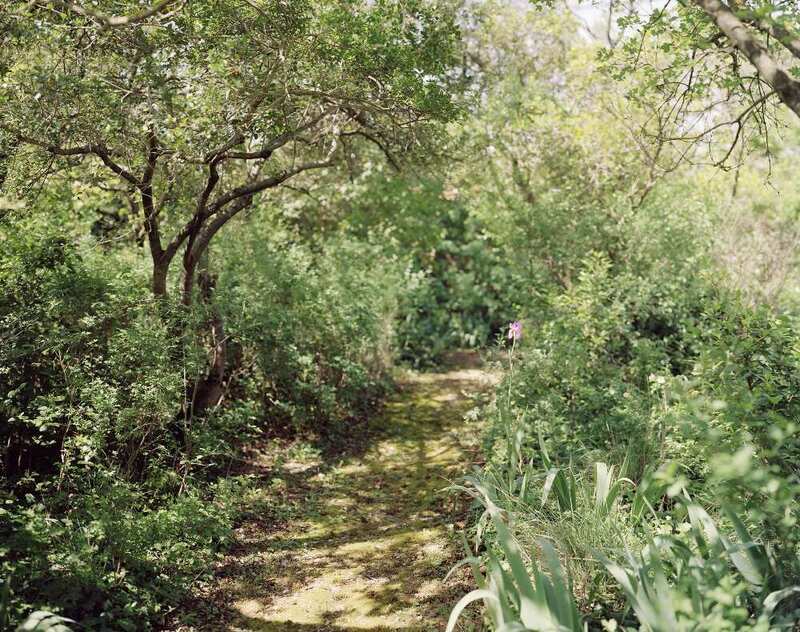 The scientist and author of Souvenirs Entomologiques lived there with his family for over 30 years until his death, the estate being the fulfillment of a long-cherished dream. In Souvenirs Entomologiques Fabre writes: "This is what I have been looking for, hoc erat in votis: a piece of land, no, not particularly big, but enclosed and protected from curious gazes; a piece of land, abandoned, infertile, burned by the sun but hospitable for thistles and Hymenoptera. [...] It is a harmas. That is what an uncultivated, rocky area, which has been surrendered to wild thyme is called [...]." In these works, the viewer's eye immediately encounters dense vegetation. 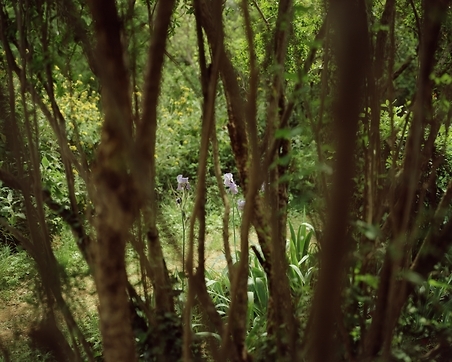 The viewer is virtually drawn into the thicket. "There is no longer any real 'sublime' in the romantic sense; rather, the sublime reveals itself in the internalisation. ", says Elger Esser. It is the projection of an imaginary world into the landscape, which, in the more recent series, increasingly shifts into the photographer’s focus. As a contrast to this, in the series of the sunsets, the viewer's eye can wander unhindered across the vast plain. This series of works is characterised by an impressionistic glowing brightness. Here Esser premières a new technique in which he prints on silver-plated sheets of copper placed on a console and leaning against the wall. Elger Esser was born in Stuttgart in 1967 and spent his childhood in Rome. In the 1990s he studied in the famous class of Bernd and Hilla Becher at the Kunstakademie/Düsseldorf, where Esser now lives and works. 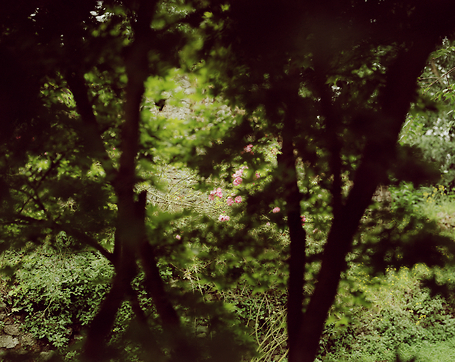 The classic genres of veduta and landscape are central themes in Esser's photographs. His works are characterised by largely monochromatic colouring, a preference for diffuse, uniform lighting and a constant tension between micro and macro structures. With sensitive and precise observation, Elger Esser captures the exact moment at which the character and the atmosphere of a landscape are revealed. Not by chance are Esser's photographs often associated with the (travel) literature of the late 18th and 19th centuries. In his more recent series, the resolution of the photographs increasingly assumes a painterly quality. Added on August 21, 2015 by ROSEGALLERY. The 2016 Great State Prize for Visual Arts of Baden-Wuerttemberg, which is named after Oskar Schlemmer, to Dusseldorf artist Elger Esser. The award was announced by Art Secretary Jürgen Walter, and is connected with a recipient's exhibition to be presented in the coming year at the Staatliche Kunsthalle Karlsruhe. With this award we put a strong emphasis in the promotion of contemporary art and to honor an artist who brings the boundary between photography and painting to flow. Artists' News: Elger Esser opening at Thaddaeus Ropac. Added on July 30, 2015 by ROSEGALLERY. Opening: Thursday, 27 August 2015, 7pm with the artist present. Visit ROPAC for more information. Added on March 17, 2015 by ROSEGALLERY. 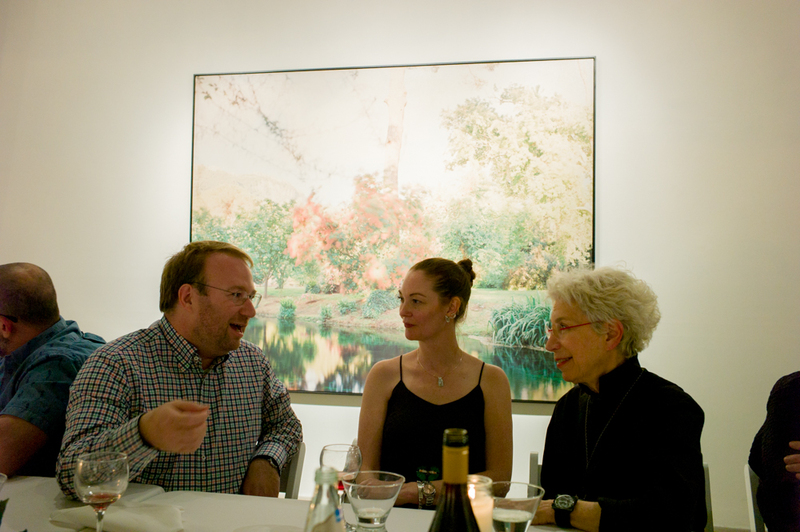 Artist Elger Esser joined us on Saturday evening for a reception held in honor of his latest exhibition, New Works. 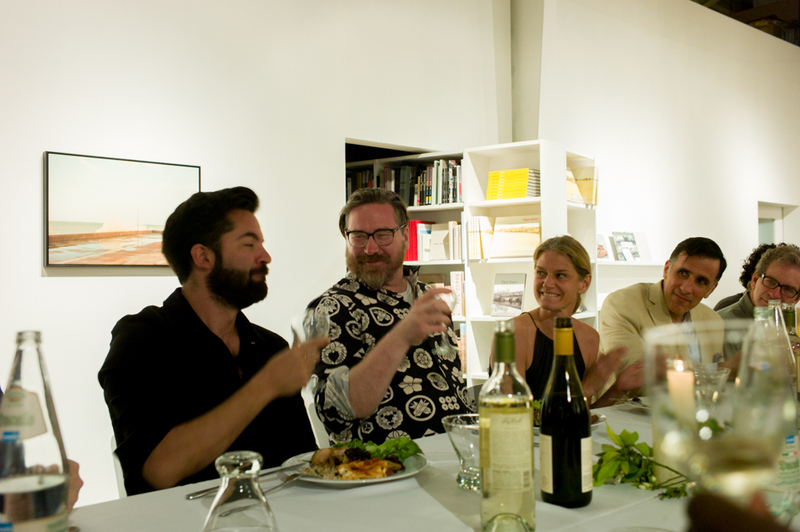 Here are a few moments from a wonderful evening with the artist (and more than a few special ROSEGALLERY friends).